I will be attending next year's 2016 International Left Hand Path Consortium. A gathering of followers and practitioners of various LHP traditions, I'll be showing mask works and possibly some paintings. All of the mask works on display will be for sale as well. I guess this seems like a nice time to say the Lords of The Left Hand Path series will getting it's first new release in some time next month. on April 11..look that date up for a clue. Check out their site Here. 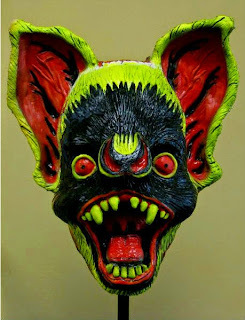 Based on the T-Shirt's design and conjuring the spirit of the old plastic Ben Cooper Halloween masks from the 70s, this guy has been finished with neon and glow in the dark paints! Also available in a more realistic vampire bat finish. Go get one!